In this post we are going to explore on the oauth2 implicit grant flow using a facebook oauth2 API example. In the oauth2 client specification, the clients are categorized as trusted and untrusted. Trusted oauth2 clients are usually application following the mvc architecture, where the application has the facility to store the keys securely. In a later post we will explore more on trusted oauth2 clients. Normal flow of an untrusted oauth2 client. 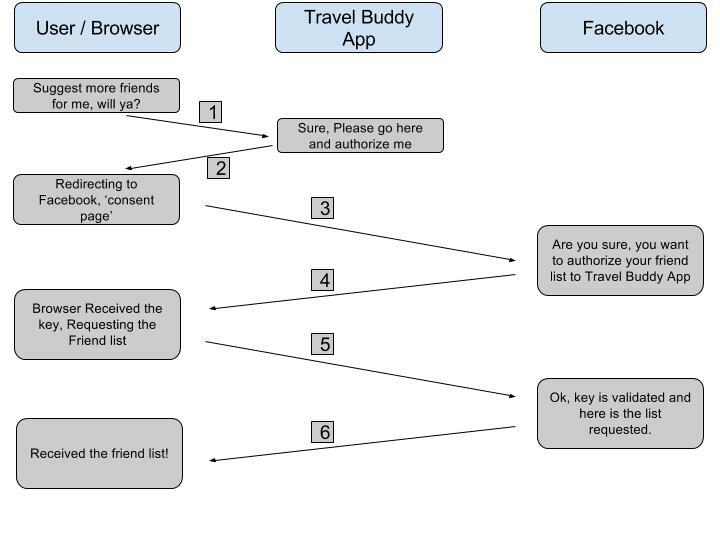 The above example use case is for a Travel Buddy App, which needs user’s facebook friend list to suggest the user travel buddies. User requesting the Travel Buddy App to suggest him more friends. Travel Buddy App, says, sure I can do that, but first goto this url and authorize me. Travel Buddy App redirect to facebook Consent Page and presented with a authorization confirmation page with list of scopes. When user, says yes, redirect to the Travel Buddy App with a token to use. Travel buddy app initiate a request to get the friend list from facebook, presenting the token received in the previous step. Travel Buddy app receives the friend list. I assume you have a facebook account and first you need to register this Travel Buddy App with facebook. Then you’ll receive a client_id for your application. Click on Add a New App and provide a display name and contact email. Click Create App ID. Then you’ll redirected to following dashboard with App Id and App Secret. Now select Add Product and select Facebook Login, click setup. Choose platform web, fill out the details and save. Now all set from facebook settings. Let’s move on the Travel Buddy App implementation. Need to create a simple web skeleton. You can use the following maven archetype. Remove the index.jsp file, since we are implementing a simple html js application. First we have to write the getting the token function. We have to make a GET request to dialog/oauth endpoint with the following details. Since we are s the application to redirect, we have to provide the redirectURL. The scope is the permission list we are requesting from the user. In this case we need public_profile and user_friends. Note that the permission list in scope variable is given a space separated list. The calling URL will be similar to the following, Note that the url parameters needs to be encoded. Then after redirecting to facebook website, if the user is already logged in, he will be presented a user consent page. If not first redirected to the login page. After the authorization of the user, will be redirected with the token appended to the browser URl. Process the browser URl and acquire the access_token. Then we have to make two API GET calls to facebook using this access token. I. Make a call to get the profile details and extract the profile ID. II. Make another call to get the suggested friend list using that profile ID. We just showing the friend list appended to the html. Now that’s it, you have acquired oauth2 token using the implicit grant flow approach and use that to extract the friend list. Set the following host entry. Deploy the webapp in tomcat and access the following url. And you’ll get the friend list data. So we have covered the implicit grant flow and the few characteristics we observed is that, it’s pretty straightforward to implement. And the negative points to be considered are approach is considered as to be less secure since we are exposing the access token, this is a short term access methodology, Since there is no way to securely store the keys, the authorization flow has to be reinitiated for latter use. Sample code can be found here. Let’s meet with a new blog post on oauth2 authorize grant flow exercise.